We run a small animal specialist veterinary centre in East Anglia and see a steady number of patients that are injured as the result of not being properly restrained in cars that are involved in road accidents. Dog guards may protect us but they are only part of the answer for the dog itself. We would never think of driving with our children unrestrained and I am a lot happier now that I know Otto has the same chances of surviving a crash as I do. I purchased an extra large single crate for my then puppy, in the late spring of 2013. There was no real value of sending a photo of Max sitting in the large space at the rear of my 2013 Mondeo Estate. Well things have progressed with Max nicely, and this morning, I took a couple of snaps, that you may find useful. Max is a 17 month old complete male Rottweiler, who currently weighs in at just over 47 kg. He has always travelled in the crate, and I would consider no other form of transport for him. He has never suffered from motion sickness or other travel related issues. As for the crate, it was assembled and fitted into the rear of the estate without any trouble, and is used in conjunction with a telescopic ramp that fits neatly by the side. Rear vision is reduced, but not alarmingly so, as he immediately lays down on entry. In summary, he loves traveling, and we are satisfied that we are giving him the best possible chance in the event of an incident. She absolutely loves it- very happy to get in and is soon snuggles down and very contented travelling in it. Thank you for your expert advice it's the perfect size for Freyja and perfect size for our car. One happy dog and two happy owners. Alison, Martin and Freyja. June 2013. "I bought my in-car dog crate from Safedog at a dog show. I carefully compared this product with the competition and found the price and friendliness of the sales team were decisive. My two dogs sat in a demonstration crate to ensure I got the correct size. On this occasion Safedog were able to build and install the crate on the same day and, being expandable, this design gives maximum room for my dogs with the option of adjustment should I change my car. Most impressed". Mr. Newman. Essex. September 2011. At the 2011 CLA Game Fair we sold a crate to a Doctor and his wife, who phoned up the following week to say how delighted they were with the crate - the first they'd seen that had considered safety in the crate design. 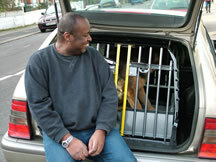 Robert Alleyne, Canine Behavioural Trainer known to all fans of Dog Borstal (BBC3) has recently discovered the benefits of the Safedog crash tested car crates. "I can't understand why anyone would travel with their dogs loose in the car these days", he said "you wouldn't dream of letting your child travel without a seatbelt, so it makes perfect sense to protect your dogs in the same way". Many thanks for the instructions and invoice for the cage. Our arms were indeed aching and very much stretched by the time we walked the 10 miles from your stall to our car thats not to mention the big bruises on the back of my legs which are still there and the countless funny looks and comments we got on the way! It was hard work at the time and I did seriously consider my mentality but I have to say it was very much worth the effort and not to mention the savings we made! I have enclosed a picture of the cage in the car which fits just nicely and the dogs fit just nicely inside too. I have to say its a fantastic product the people we have shown are very very impressed, our neighbour who has 2 labs was almost dialling your number as he looked at the cage to order his, until he asked us the price and decided he would have to save a few more pennies before he ordered one  having said that he was still very impressed even though he couldnt afford one right away. We go to lots of dog shows, flyball and agility competitions not to mention all of the walking we do so when people come to chat and no doubt notice the cage (as they did my old one) and comment we will certainly pass on your details. Thanks for the time you spent with us and recommending such a fantastic product, lets just hope we never have to test its strengths in a crash.